How do I buy an item for sale on the site? You can view any item and its details without being logged into UniversalClassicToys.com or UcToys.com. However, if you wish to buy an item, you must be logged into the website. Once logged in, you'll see the “Add to Cart” button on the category item listings and in the detailed description of each item. Once you’re done shopping, choose the Cart checkout icon located on the top right page and it will prompt you to checkout, payment and change of address. Please review the detailed description for each item very carefully before final committing to finalize sale. How do I contact UniversalClassicToys.com about an item? To contact UniversalClassicToys.com regarding a particular item, you can do so by simply use the Contact us link and we’ll respond immediately after receiving your inquiry. Yes, simply specify the Shipping Address to which you would like your order shipped during checkout. The recipient of an international shipment may be subject to customs brokerage fees, import duties, and taxes after the shipment reaches the destination country. Additional charges are the responsibility of the recipient because we have no control over these government-imposed charges and cannot determine what they may be. Customs policies vary greatly among countries. Please contact your local customs office for information. Please expect two to three weeks for delivery of your product depending on the destination country. UniversalClassicToys.com is required to charge applicable state sales tax on orders for residents of California. The applicable sales tax charges will be listed during the checkout process. How do I locate particular model or product? You may search for items using the “Search” box located at the top right of any page on our site. Type in an item, brand or an item number, and then click the “Search” button located beside the search box. Any items that match your search criteria will appear on your screen. You can also enter item number in the search box and click on the “Search” button to look up a specific item. What does UniversalClassicToys.com do with my personal information? UniversalClassicToys.com collects personally identifiable information when voluntarily submitted by users, including names, postal addresses, email addresses. We will not sell, distribute, or lease your personal information to third parties for marketing purposes without your explicit consent under any circumstances. Is my data on the site secured? In order to keep your personally identifiable information secure, only authorized employees, agents, and contractors of UniversalClassicToys.com have access to this data, which is stored on state-of-the-art servers in the United States. We have implemented rigorous managerial, physical, and technological protocols to protect the information we collect on the website from unauthorized access or disclosure. Your username and password information can be easily retrieved by clicking the “forgot password” link and then “Retrieve your account information.” Once you click this link, you’ll be prompted to enter and submit the email address associated with your account. We will then send an email to that address containing your login data. If you need to modify or update the information in your UniversalClassicToys.com account, you can do so by logging in, accessing your account page, and clicking the link to your profile. On your profile page, you have the option of modifying your address, physical and email addresses etc. What if I have a Collection to sell? Contact us we will discuss the details and give you proper evaluation, in most cases, we would ask for accurate description and multiple photos, if there are other ways you may choose to discuss please feel free to let us know. Online shopping at UniversalClassicToys.com is extremely safe. UniversalClassicToys.com is fully equipped with a secure server for all online transactions. All transactions are encrypted and protected using secure socket layer (SSL) Encryption, the industry standard for securing your credit card and other personal information online. 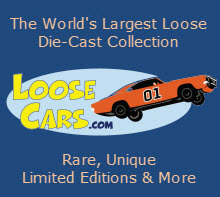 What exactly does “Die-Cast” mean? Die-cast is a term for a manufacturing process whereby molten metal — usually zinc or aluminum — is injected into steel molds. The parts that come out of these molds — the car bodies, doors, hoods, trunks, chassis, etc. — are used in the assembly process. The term die-cast was originally used to differentiate scale model material, as in die-cast metal models vs. plastic models. But the term has become generic and many times just the word die-cast is used to describe the type of model. What does “scale model” mean? “Scale” refers to the size of the model in relation to the actual car. For example, if the scale is listed as 1:64, then the model is 64 times smaller than the original car. Common scales are: 1/64, 1/43, 1/24, 1/18 Scaling initially became popularized mostly due to the model train hobby. Why do I see other die-cast models at much lower prices? There are many types of models and model kits available at all levels, from entry level pricing to very costly rare-find models. Due to several factors, including the number of parts, the functionality, the detailing, the quality of the paint finish, edition limits and the attention to scale are some of the reasons that our models — which we believe to be the best — command a higher price.